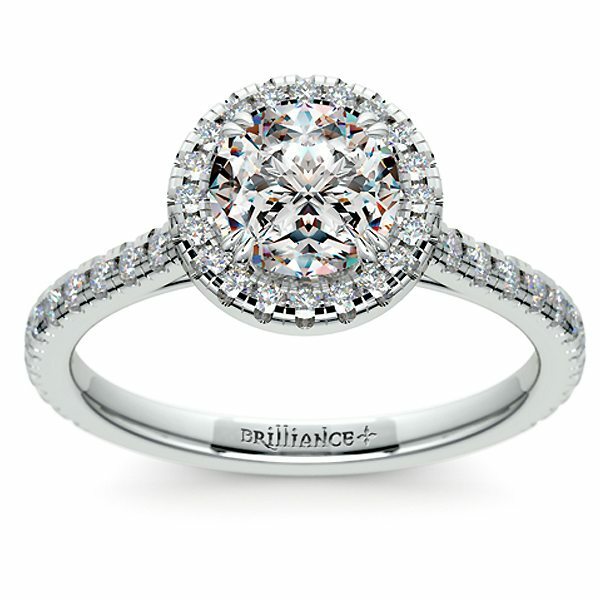 A Halo setting is a ring setting that has a center stone encircled by smaller stones, most commonly diamonds. The angelic quality of the halo setting has drawn the eye of the masses. This centuries old setting originated in the Georgian Era (1714-1837). In that time, the side stones were only marginally smaller than the center stone. During the Victorian Era (1837-1901) it was typical for the center stone to be a gemstone other than a diamond. Two of the most popular gemstone choices being Sapphire or Ruby. Following the Victorian Era, the halo settings popularity experienced a lull until the Art Deco period of the 1920s. This style of ring fit right in with the art and architecture of the twenties (clean lines and symmetry). 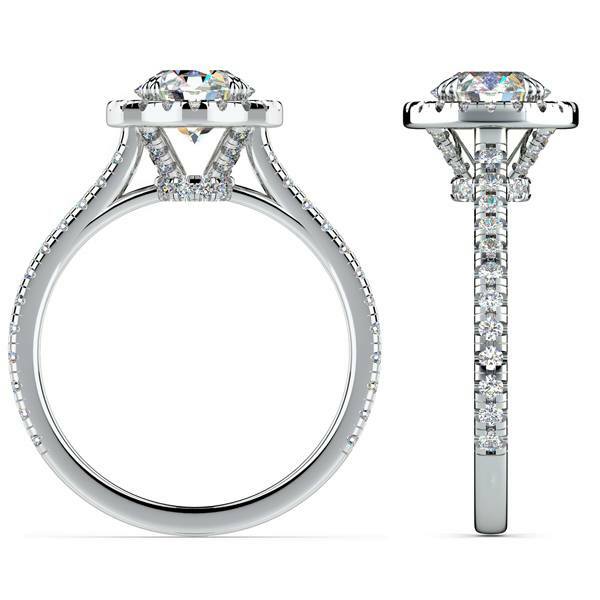 This classic ring setting has come back into the spotlight, mostly resembling the halos of the 1920s. The most recent development in the modern era is the double halo style. Instead of one ring of diamonds around the center stone you can now have two. The Petite Halo Diamond Engagement Ring in White Gold exudes elegance and style. The Petite Halo boasts sixty six round cut diamonds totaling 0.42 ctw. These side diamonds are French Pave set. This means that the diamonds are placed close together so that no metal is showing between them. The center stone is shown above as a round cut, though any shape gemstone can be custom fitted to this setting. The V-split diamond shank adds a detailed touch that surrounds the bottom of the center stone. This also adds height to the halo, truly creating an aurora for your angel. Ready to choose the center stone for your Petite Halo? Well let’s get started angel!